The price of the Prakticello is $1450.00 (plus shipping), this includes strings, carrying case and fiberglass endpin but not a bow. The instrument will be ready to play and travel. You supply your own normal size bow. 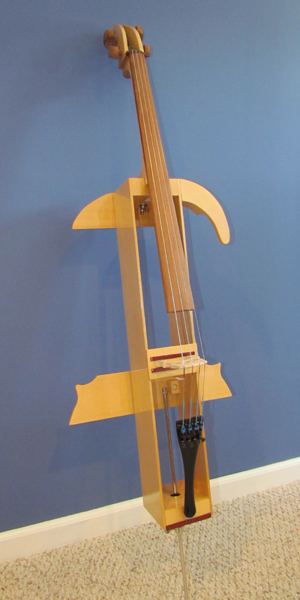 Your cello bow is stored safely inside the body of the instrument during travel. The Prakticello is varnished using an instrument oil varnish. I do also take orders for 3/4 size Prakticellos. I ship worldwide via UPS based on the costs involved. All shipments are insured for the above amount. Shipping in the USA can vary depending in what part of the country you live in. For example shipping to Boston or Miami from would be approximately $48.00, San Francisco $59.00 and Austin, TX $55.00. I will give you an accurate quote based on the rates at UPS at this moment if you provide city and zip/postal code. Once shipped I will provide a tracking number. For international shipments possible instead of using UPS as an option, you use a forwarding agent like hopshopgo.com, it will reduce shipping costs by about 50% and I have shipped many instruments that way. You will need to create an account with them. Example, total shipping costs to Norway and Australia are about $150.00. If you are interested please let me know your city and zip/postal code and will provide an accurate price for the shipping cost. If you have a travel date please let me know. Payment can be done via personal check (US and Canada) or bank wire or via Zelle. Sorry, I do not accept credit cards directly or PayPal. Credit cards can be used through Western Union. If emailing please include your country and your phone number and a good time for me to call you if needed.